Did you know that the three most popular days for online Instant Gift Card sales are all “Eves”? Christmas Eve, Valentine’s Day Eve & Mother’s Day Eve. Panicked gift givers who didn’t plan ahead can access your salon’s website and purchase a lovely, thoughtful gift for their loved one, making instant gift certificates the biggest money making opportunity you have on “Eves”. In addition to offering gift cards for dollar amounts, consider putting together some packages. When people receive a gift certificate for a dollar amount, they tend to use it to purchase services they are already receiving at the salon. It is more profitable to sell “luxury service” packages. Luxuries are the perfect gift. You are exposing clients to services they may be interested in but have never tried and many will continue to get them, at least occasionally. Packages are also a great opportunity to sell combinations of services, and get guests to try services they may have otherwise never tried. Create packages at several price points. Don’t be afraid to offer high priced items like “A Year of Hair Color” or “A Massage of the Month”. Gift givers can be very generous with their money, if the gift is right. Encourage higher gift card sales by combining 3 or 4 services into a "beauty day" specially priced at 25% off for a limited time near your important “Eves”. 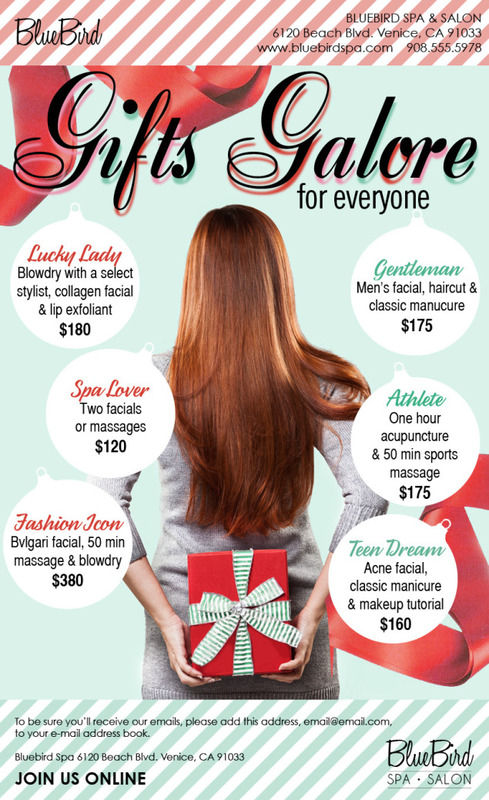 Create in-salon signage to let your clients know what gift packages are available. Instant purchase applications help you work smarter, not harder and can add thousands of dollars to your bottom line. BeautyMark Marketing believes that online commerce should be easy and all salons and spas should maximize the power of the web. BeautyMark makes it easy for salon owners to start selling gift cards online by providing a stand alone, turn-key, secure, and full featured gift certificate shopping cart system branded with your company's logo. It is easily added to your existing website with a simple link or buy now button. Make it easy for clients to buy! Sell instant gift cards for packages or dollar amounts in higher denominations. Custom signage helps you sell even more (hint, hint: BeautyMark does this). Happy Selling! What else does BeautyMark Marketing do? BeautyMark Marketing grasps the unique demands of the salon owners. Our beauty marketing expertise combined with effective up-to-the-minute technology can elevate the image of your salon in the minds of your potential guests. BeautyMark Marketing is the only source of upscale “off-the-rack” marketing at Ready-To-Wear prices. Subscribe to our monthly marketing system for stunningly stylish email campaigns, social media posts, digital web banners + all the in-store collateral you require to support your campaigns such as window clings, mirror talkers and bounce-back cards. BMM creates savvy salon/or spa web sites. Our team is focused on the graphics, interface design, as well as the art of “find-ability” factor (SEO). Our sites always include easy contact management and can add-on the Instant Gift Card application. BMM gives 1 free hour of editing time monthly. 3) We also understand the importance of fresh content on your site, which is why we offer blogging services as well. Tell us your salon's TOP 3 MARKETING PRIORITIES for 2014, and then let's do something about it!